Are you investing in multifamily properties? If you need a loan, you have options. Here are 4 different types of multifamily financing and the terms. As around 12 million people now own a second home, many people are finding that it’s a great way to get a second passive income. If you’re looking to find a way to own property and like the idea of being a landlord, multifamily financing for multiple dwelling properties can help. Here are four of the most common types of financing and what you need to do to qualify for them. If you’re looking to get a multifamily loan and aren’t sure about going through a private lender or don’t want to pay their fees, you could go federal. There are government-backed financing options that are sponsored by lenders like Fannie Mae and Freddie Mac. The Federal Housing Administration also offers multifamily loans to give you even more options. With these types of financing, you can get properties with two to four different units. There is another set of financing options available to help you afford property with five or more units as well. If you plan on living in one of the units and renting the others out, you’re in the ideal position for a government-sponsored loan. There are investors who might have just a small amount of money to contribute to a down payment but want to own and manage a property. Multifamily financing is a great idea for them as well. With just 3.5% down for your property, you can get an FHA loan for a multifamily residence. For such a low down payment, you can have some serious buying power to afford a better property in a nice neighborhood. Additionally, you could end up applying 75% of your rental income toward buying your next property. Search for a government-approved mortgage lender if you want to get this kind of financing. Multifamily loan options might be more within your reach than you think. If you prefer a conventional mortgage, you can get one for your multifamily property from most traditional lending institutions and banks. If you hold loans or currently work with a major bank, you should start with them when looking for financing for your property. You’ll find mortgage options that range from 15 to 30 years to fit your budget. You can finance units that have two, three, or four units. Buildings with five or more units will require a different kind of mortgage. If you’re looking to invest with a long-term loan, a conventional mortgage is going to be the ideal option for your budget and your time frame. This isn’t the type of loan to get if you plan on buying a place that you rehab. 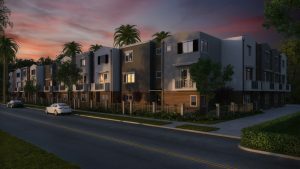 A conventional multifamily property loan is best for someone who has a strong relationship with a lending institution that gives out these types of loans. If you’re curious about how much of a loan you could get, you need to investigate your regional maximums. Costs are set based on the area you’re looking to buy in. Usually, your down payment on a conventional multifamily unit is around 20% of the total price. Be sure to investigate the interest rates before you decide on a mortgage. There are fixed and variable rates that should come into play when you’re deciding which type of mortgage you want. Fixed rates are often higher than the current standard rate but if the market looks like it’ll shoot up soon, it’s good to lock in a strong rate now. If you’re thinking about getting a nonconforming loan because you’re interested in a property that’s anywhere from two to more than five units, this could be for you. A portfolio loan is still a permanent mortgage but the terms can vary wildly, starting around three years and stretching all the way to 30. There are a lot more options with this type of loan than others. If you’re an investor in need of flexible loan requirements, this is the type for you. For investors looking to build up a set of multifamily properties to build income and wealth off of, this type of loan could finance up to ten properties at the same time. A portfolio loan will be a much bigger commitment than any of the others, but if you’re looking to start a property company, this is the way to go. You won’t find that these loans have the same kinds of limits that the Fannie Mae or FHA loans need to have. Since these are nonconforming loans, there are a lot of different types of lenders that will offer them. Standard banking institutions, savings and loan companies, and credit unions all offer these types of loans. Portfolio loans can even be obtained from private lenders for larger projects, however, be aware that you could be facing higher interest rates there. You could get 80% of the cost of your property financed by these types of loans, depending on the lender who you work with. If none of the other options work for you, short-term loans are an option that you shouldn’t overlook. You could finance a property from six months to three years. These loans could offer you options for bridge loans or hard money loans with payments that are meant to cover just the interest. If you need to renovate or rehab a property, this is the right option for you. For some lenders who already own a multifamily property, they might find that changing municipal laws require them to meet new codes and laws. In order to do this, they might need to get a short-term loan to finance the new fire or occupancy codes. Should you still need to find the right loan for you, you can see some more options if you view here. If you’ve never considered multifamily financing, you might find that it’s not as hard to obtain as you thought. It’s a great way to buy up multi-dwelling properties and help contribute to your favorite neighborhood. If you want to teach your kids all about real estate investing, check out our guide for tips.